The best part about being a comedian is that everyone you encounter feels obligated to graciously offer you their hot takes on comedy. Everyone, from your gynecologist to the drunk dude who stumbled into the bar show while you were performing, is more than willing to give you some hot tips on how to make your “skits” great. Each piece of informed advice is greatly appreciated, but none can quite compare to that of a special someone: your boyfriend’s dad. He has never performed comedy, but he has watched Seinfeld and he does have some thoughts. Here are some useful suggestions on what to do with your face when he takes it upon himself to talk to you, a comedian, about his knowledge of comedy. In order to immediately prove your worth, make sure to nod aggressively and confirm that you have, in fact, heard of underground comedian Bill Burr. Then, purse your lips into a tight smile that says “I acknowledge that what you just said were words,” while simultaneously screaming an internal scream that reverberates through the depths of your broken soul. It can be difficult to mask unbridled fury with gentle, approving charm. But that’s not to say it can’t be done. Tilt your head to the side in a nonthreatening manner, not unlike an idiot puppy, and nod slowly in faux contemplation. This makes it look as though you are giving his suggestion serious thought and consideration. Feels good to look cute and lie at the same time! Open your mouth and release a loud, forced “Ha.” Sometimes you can get away with mocking someone’s garbage behaviour in a way you might call subtle and they might call undetectable. This is one of those times. Now he thinks you think he’s funny, which is the end goal for everyone here. Finally, comedy pays off. Take a huge bite of your mashed potatoes and focus on not tilting your eyes into the back of your skull. It’s important to maintain a neutral expression at this time. You’re not agreeing to the idea of ever revisiting this experience again, but you’re also not rudely telling him that nothing at this dinner table is worth sharing with a crowd of people. Yum! Raise your eyebrows, bare your teeth, blink every five seconds and breathe through your nose and mouth at the same time. I’m pretty sure this is how you express enthusiasm? Wow, here is your chance to shine! 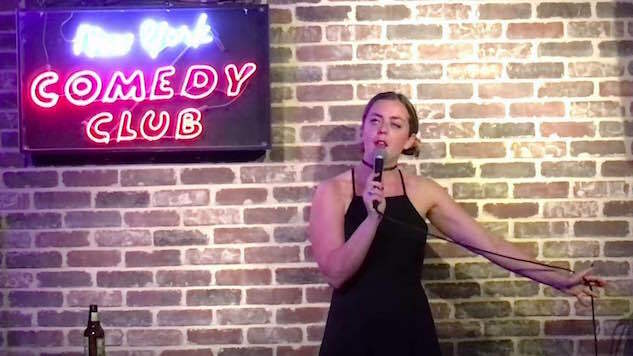 Open your mouth wide and place your hand on your chest to demonstrate that you are honored to be compared to the only other female comedian who exists. Then contort your face into a grotesque expression to prove that you are not like the other girls. Force your mouth into a concentrated frown while furrowing your brow and looking off into the distance. This is the classic “I had not yet considered that it might be a good idea to observe what is occurring” look that dads love. It’s important to let him bask in the glory that his son is dating a woman who thinks, but only when he reminds her to. Now is the time to give the people what they want. Show your true colors by going into complete panic mode. Smile with far too much force, shift your eyes, exhale audibly and then sprint outside, find the nearest boat and pilot it across the harbor. Honestly, that’s spot-on Louis CK impression. Oh good, we’ve come back to Amy Schumer. At this point, there’s no expression needed. Just stand there with your regular face. You look just like Amy Schumer. Well done! Irene Fagan Merrow is a comedian and writer based in Brooklyn.